The digital archives of Shooting Sports USA magazine (SSUSA) features an Expert Forum on Wind Reading. This outstanding article on wind reading starts off with a section by ballistics guru Bryan Litz, author of Applied Ballistics for Long-Range Shooting. Then four of the greatest American shooters in history share their personal wind wisdom. Lanny Basham (Olympic Gold Medalist, author, Winning in the Wind), Nancy Tompkins (Past National HP Champion, author, Prone and Long-Range Rifle Shooting), David Tubb (11-Time Camp Perry National Champion), and Lones Wigger (Olympic Hall of Fame) all offer practical wind-reading lessons learned during their shooting careers. CLICK HERE to Download Article Issue in Printable PDF Format. Shooting Sports USA magazine (SSUSA) has a modern, mobile-friendly website with tons of great content. Log on to www.ssusa.org. There you’ll find current news stories as well as popular articles from the SSUSA archives. The SSUSA website also includes match reports, gear reviews, reloading advice, plus expert marksmanship tips from the USAMU. Share the post "Wind-Reading Tips from Champion Shooters"
Do you know which one of your eyes is dominant? It’s easy to determine eye dominance with a simple exercise. Pick an object about 6-10 feet away (a light switch or door knob works well). Make an “OK” sign with your right hand (see photo) and hold that about 18″ from your face. Now, with both eyes open, look through the circle formed by your thumb and index finger. Center the circle on the object, so you can see the object in the middle. Now, here’s the important part — while still holding your hand up, centered on the object, first close your right eye. If you don’t see the object anymore, then your right eye is dominant. If you still see the object, then repeat the procedure with the left eye shut and right eye open. If you don’t see the object when your left eye (only) is closed, then you are left-eye dominant. The digital archives of Shooting Sports USA contain many interesting articles. A while back, Shooting Sports USA featured a “must-read” expert Symposium on Eye Dominance, as it affects both rifle and pistol shooting. No matter whether you have normal dominance (i.e. your dominant eye is on the same side as your dominant hand), or if you have cross-dominance, you’ll benefit by reading this excellent article. The physiology and science of eye dominance is explained by Dr. Norman Wong, a noted optometrist. In addition, expert advice is provided by champion shooters such as David Tubb, Lones Wigger, Dennis DeMille, Julie Golob, Jessie Harrison, and Phil Hemphill. I keep both eyes open, always. Some use an opaque blinder in rifle or shotgun shooting. If you close your non-dominant eye, you will not get as good a sight picture. If your aiming eye is not your dominant eye, you have even more of a problem to overcome. Shooters should try to use the dominant eye unless the vision is impaired and the non-dominant eye has better vision. You should always shoot with both eyes open since this will allow the shooting eye to function properly. I close my non-shooting eye initially. Once I pick up my sight picture, it’s not something I focus on. For those that use a patch, I recommend that they use something white to block their view, rather than cover the eye. Some shooters, especially those with nearly equal or cross-dominance, will naturally find themselves squinting one eye. When anyone does this, you are also closing your dominant eye to some extent and adding stress to your face. Share the post "Are You Right-Eye or Left-Eye Dominant? Do This Simple Test…"
In this article, three great champions reveal their wind-calling secrets in video interviews. We first published this “Three Champions” story a few years ago. If you are a competitive shooter, and you want to learn more about reading the wind, you should watch all three of these interviews. These guys are among the best shooters to ever shoulder a rifle, and they have much wisdom to share. At the 2010 SHOT Show, we had the unique opportunity to corner three “superstars” of High Power shooting, and solicit their wind-reading secrets. In the three videos below (in alphabetical order), Carl Bernosky (10-Time Nat’l High Power Champion), David Tubb (11-time Nat’l High Power Champion and 7-time Nat’l Long-Range Champion), and John Whidden (5-Time Nat’l High Power Long-Range Champion) shared some of the wind-doping strategies that have carried them to victory in the nation’s most competitive shooting matches. This is GOLD folks… no matter what your discipline — be it short-range Benchrest or Long-Range High Power — watch these videos for valuable insights that can help you shoot more accurately, and post higher scores, in all wind conditions. Top photo courtesy Rifleman’s Journal. Share the post "Three Champs — Bernosky, Tubb, Whidden — Talk Wind Reading"
Rifle Crafted by PremierAccuracy.com. Inset 6XC II photo by 6mmAR.com. With all the buzz about the 6.5 Creedmoor and its 6mm Creedmoor little brother, some folks forget that we’ve had an outstanding mid-sized, Across-the-Course cartridge for a long time — the 6XC. Pioneered by 11-time National High Power champion David Tubb, the 6XC has won national High Power championships, excelled in mid-range prone matches, and performed great in the varmint fields. It has also been used successfully by many Precision Rifle Series competitors. It’s no wonder — the 6XC has less recoil than a 6.5mm Creedmoor, there is a great selection of superb 6mm bullets, and Norma-made 6XC brass is high-quality and reasonably priced from DavidTubb.com. The 6XC II Chamber works perfectly with the Norma 6XC brass and resolves the “sticky bolt lift” issue. The original 6XC chambering was designed based off the usage of 22-250 brass which typically has a web diameter in the range of .461″-.463″. The area of the chamber just forward of the web on the original 6XC chambering was .4695″ which left plenty of clearance. When Norma 6XC brass became available Norma appears to have developed the base of the case from the .308 Winchester line of cases which have a larger web diameter. The web diameter of the Norma brass typically measures right around .4685″ which leaves almost no diameter clearance. As shooters would use Norma 6XC brass in an original 6XC chamber they typically would experience “sticky bolt lift” due to the lack of clearance and the fact that the large web diameter of the brass prohibited the re-size dies (no matter how small the base diameter was) from squeezing the brass down enough to create sufficient clearance. The 6XC II chamber resolves this issue. You can order 6XC II sizing dies from 6mmAR.com that work perfectly with this re-designed chambering. 6XC II die sets are in stock now — call (215) 348-8789 to order. The 6XC II-LT reamer below is throated long to keep the full bearing surface of 110-115gr bullets forward of the neck/shoulder junction of the case. Note, 6mmAR.com has also developed a shorter-freebore version for 6mm bullets with shorter bearing surface. SEE shorter 6XC II Reamer Print. – Resolves the “sticky bolt lift” problem shooters experienced using the Norma 6XC Brass in the original 6XC chambers. – Chamber accepts all 6XC brass or ammo with no modification. Take your existing 6XC brass or ammo and use it without issues. – Works well with existing Norma 6XC brass, or 6XC brass made from re-formed Winchester and Remington 22-250 brass. – 6XC II Sizing dies and die sets are available from 6mmAR.com and in stock. If you are looking for someone to chamber your rifle or re-barrel an existing rifle in the 6XC II chamber, Fred at Sabreco, Inc. in Skippack, PA, (610) 584-8228 can help you. He has the reamers for the cartridge as well as the head space gauges for the cartridge, and has had extensive experience chambering many barrels and rifles. Share the post "6XC II — Great 6mm Option For Precision Rifle Series"
Share the post "How to Shoot Standing — HP Champion Carl Bernosky Explains"
Our friend Kevin Nevius, best known for his smallbore skills, went head to head against the nation’s top long-range aces this past week, and emerged on top. Besting the likes of past multi-time Long Range Champions David Tubb and John Whidden, Kevin Nevius shot superbly at Camp Atterbury to win his first NRA National Long Range Championship. Kevin finished with 1245-64X, one point ahead of Phillip Crowe, 1244-74X. Bob Gill, shooting a .223 Rem with iron sights, was third on X-Count, with 1244-68X. Kevin built his own rifles for the match, using Kelbly centerfire actions in a Grunig & Elmiger smallbore stock. Here is Kevin’s first-hand report of his 2018 LR Championship victory. This was my first opportunity to shoot the NRA Long Range Nationals since its relocation to Camp Atterbury, and it was great to see everyone and get back to the matches. It is always so humbling walking onto the range and seeing all of the people I read about and admire so much. I can’t think of another sport where people so accomplished will share so much and be so helpful. Regarding the weather, we had generally great conditions with very mild winds in the mornings, building gradually as the days progressed. By the afternoon hours, there were certainly challenges as the air started moving. Obstructions to the wind on either side of this range vary, so you needed to pay attention for sure — it may be calm at the targets or firing line, only to show something to worry about on the mid-range flags. Mirage is my primary indicator shooting smallbore, but mirage over 5/8ths of a mile is a little less telling (and a lot more confusing, at least for me!). I think most competitors, including me, use some combination of mirage and flags to make corrections. At the start of the string, I try to gauge a predominant condition, and more importantly which indicator is the most reliable to look at to determine that condition. Smallbore shooting is where I learned to build a good position, and so much of that carries forward to Long Range High Power. It was a huge shock though, the first time I looked at a 44” aiming black through aperture sights at 1000 yards! Smallbore aiming blacks are twice as big, at one tenth the distance — the fact that we can hit something at 1000 yards with that sight picture still amazes me! I have always build my own rifles, and always struggled to get the individual rifles you need for the LR aggregate (Any and Palma) and smallbore to feel, balance and fit identically. This year for the first time, I machined bedding blocks that allowed me to put almost identical centefire barreled actions into my smallbore prone stock – effectively making the position and fit of all the rifles for all disciplines identical (it is, after all the same stock used for everything). I used two modified Kelbly Grizzly actions (one barreled in 6.5×47 for the any rifle matches, and one barreled in 308 for Palma) fitted to two identical aluminum bedding blocks. The bedding block footprint matches my smallbore barreled action – a Grunig & Elmiger Racer WC. The stock is a Grunig & Elmiger Hybrid, which is a composite aluminum skeleton and carbon fiber skin. I was using a 6.5×47 Lapua in the “Any Rifle” matches. The barrel is a 1:8″-twist Benchmark medium Palma contour finished at 35 inches, throated +0.060″. My 6.5×47 load was Lapua brass, CCI 450 primers, VV N160 powder, and 140 grain Berger Hybrid bullets. For the Palma match, a .308 Win barreled action was fitted in the same Grunig & Elmiger smallbore stock. The .308 barrel was another Benchmark 35″ medium Palma, using the current Fullbore chamber throated +0.120″. I was using Lapua .308 Palma small primer brass, Federal 205M primers, VV N140, and 155 grain Lapua Scenar L bullets. To put it all together takes so many things — preparation, tuning, load development, position practice. And yes, it takes some divine intervention for sure. I will never forget this experience, and am so grateful to have been successful this year. Kevin noted that it was intimidating to be squadded between David Tubb and John Whidden, two multi-time Champions. Unfortunately Tubb, who had shot brilliantly (800-50X) throughout the Long Range event, had issues with his .308 Palma rifle on the final day. Kevin noted: “Yes David had some problems with his .308. When we arrived at the range on the last day, for the Palma Individual, David was in the lead with 800-50X, having shot ‘clean’ (not dropping a point). Bob Gill was second with 798-43X, and I was in third place with 798-42X. As we started the 800-yard string, there was some commotion going on to my left, and all I know is that as we finished and started moving to 900 yards, David was not happy. I believe he had lost 4 points at 800. We went to the pits, and he said his rifle was not shooting well, and he was pretty unhappy to say the least. He tried to adjust the seating depth of his ammunition before heading back out to the 900-yard line, in the hopes the gun would shoot better”. But it ended up a very tough day for David, as his chances for another LR Championship vanished. Editor: With a 800-50X total, David Tubb was the Winner of the Canadian Cup Trophy, earned before the last day. Editor: Gill finished 3rd overall, just one point down from Kevin, and six Xs behind runner-up Phillip Crowe. Gill also won the Sierra Trophy. Share the post "Kevin Nevius Wins 2018 NRA Long Range Championship"
Shown above is David Tubb, the legendary 11-time National High Power Champion, posing with a very serious rifle used in the Extreme Long Range (ELR) game. David has jumped into the Extreme Long Range discipline in a very big way, producing a .375-caliber, long-barreled ELR version of his famous Tubb rifle, called the Adaptive Target Rifle (ATR). A version of this rifle, piloted by David’s son-in-law Nate Stallter, set the current ELR World Record in January 2018. See video below for a full report. This video shows Team TUBB setting a new ELR World Record of 2011 Yards using the Tubb Adaptive Target Rifle in .375 CheyTac. Nate Stallter nailed three shots at over one mile — 1768 yards. Then Nate broke his own record, going 3 for 3 at 2011 yards. ELR Central hosted this match, held at the Front Sight gun range, Pahrump, NV on January 21, 2018. David has been working with Chase Stroud, a talented young Texan who has competed in tactical rifle competitions and worked with Team Applied Ballistics on ELR projects. Chase has long respected Tubb’s shooting ability as well as his design/engineering talent in developing successful rifle platforms, such as the ground-breaking Tubb 2000. “Growing up as a kid I taught myself to shoot long distance from David’s videos. David Tubb was my idol then and still is now. Never in my wildest dreams did I think I would share the line with him much less get to represent his product in the long range community. A literal dream come true for me…. Share the post "David Tubb Builds ELR Adaptive Target Rifle for Chase Stroud"
We had a great time on Day One of SHOT show. We saw some amazing products, including a remarkable upgrade to the Annealing Made Perfect system — a computer-controlled automated case feeder. We met with legendary Champions Carl Bernosky and David Tubb. 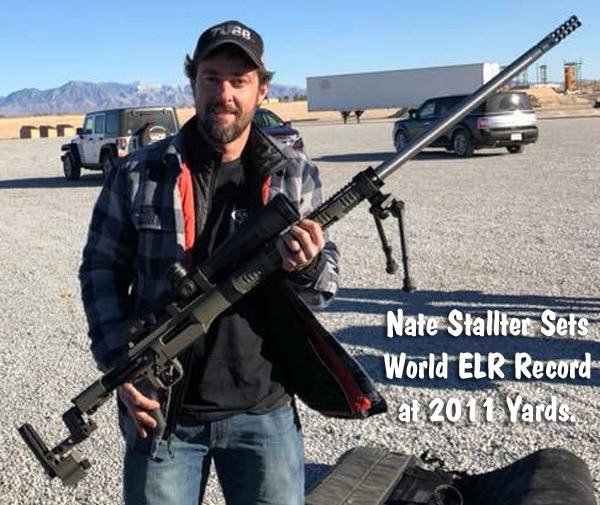 David’s son-in-law Nate Stallter recently set a World Record at the first-ever ELR Challenge match, hitting 3 of 3 shots at 2011 yards with no sighters. We also attended a seminar with Bryan Litz and saw a host of new rifles and pistols which we will showcase in the next few days. We met with Nate Stallter, the young marksman who dominated the first-ever ELR Record match held January 21, 2018 in Nevada. Shooting a Tubb LR rifle chambered for the .375 CheyTac cartridge, Nate went 3 for 3 at 2011 yards, after doing the same at one mile. Nate’s spotter was his father-in-law David Tubb, 11-time National High Power Champion. We recorded a long interview with Nate and David that provides many interesting insights into the ELR game. The micro-processor controlled AMP Annealer, already the most advanced personal annealing system on the planet, is now even better. The Annealing Made Perfect team of Alex (father) and Matt (son) Findlay showcased the new automated case-feeding option for AMP owners. This can load brass from a hopper, completely processing each case in about 10 seconds. We filmed video we’ll run in a follow-up story. There is also an important new software upgrade that allows AMP owners to precisely determine the right setting for their brass. At the McMillan Stocks booth, we met with Company President Kelly McMillan. We talked about the growing popularity of Extreme Long Range (ELR) shooting. Kelly showed us the stock McMillan has developed for the ELR discipline, fittingly named ‘The Beast 2′. This is a very long stock designed to tame the recoil of big cartridges like the .375 CheyTac and .338 Lapua Magnum. We talked at length with Clay Rhoden, the talented young owner of TargetVision, producers of the most highly-rated target cam systems on the market. Clay showed us his best $899 high-end systems, the UltraHD targetcam, along with the new Extreme Long Range product rated for two miles. TargetVision, which outputs WiFi signal directly to your smartphone or tablet, is the official Target Camera of the U.S. F-TR Rifle team. At the Kestrel booth, Bryan Litz of Applied Ballistics, along with firearms trainer Todd Hodnett, gave a short seminar on Kestrel features/capabilities, ballistics, and bullet design. We asked Bryan “Should competitive shooters tip their bullets?” He answered “It depends…”. Bryan explained that if the bullets are very uniform, with small meplats out of the box, the benefits of tipping may not be so obvious. No SHOT Show experience would be complete without a stop at the Smith & Wesson booth. There were some new Performance Center revolvers on display. The long-barreled wheelguns in the foreground below are chambered for the mighty 500 S&W Magnum cartridge. We visited the Sierra Bullets booth to pick up samples of the new High-BC 95gr .224 MatchKing and 150gr 6.5mm MatchKing. While there we spotted this stunning F-Class rig decked out in Sierra Green livery. This beautiful rifle was crafted by Kelbly’s. It has a Panda action and a stunning green, metal-flake paint finish. Peterson Cartridge Company showcased a quartet of new brass products that will enter production later this year. Peterson is expanding its line of American-made cartridge brass to include 6mm Creedmoor (both large and small primer), 6XC (both large and small primer), .270 WSM, and .300 WSM. We like the availability of 6XC in with a small primer pocket option. This should be very popular with the PRS crowd. Peterson’s .270 and .300 Win Short Mag brass gives hunters and target shooters new options. We wanted to take home these new Howard Light electronic muffs with advanced, faster internal circuitry. Offered in a variety of colors, the new Impact Sport Bolt muffs offer a lighting-fast 0.5 millisecond reaction time, plus improved digital sound compression and wind noise reduction. These new muffs carry a 22 db total noise reduction rating (NRR). Share the post "SHOT Show Day One — People and Products"
The latest issue of Shooting USA magazine has a detailed EIGHT-page feature on the Kestrel wind meter. This story covers the development of the Kestrel and explains the advanced technologies now offered with the hand-held Kestrel systems. The eZine version of Shooting Sports USA (SSUSA) is available for free online. In the latest December 2017 issue you’ll find two excellent articles of interest to all serious rifle shooters. One covers the development of the Kestrel weather meter, which has evolved to serious levels of sophistication. Now premium Kestrels include built-in ballistic calculators and they can “talk” with mobile devices, sharing command functions and data. The second article covers shooting skills. In the first of a three-part series, Glen Zediker talks about NRA High Power rifle competition. Glen spotlights the skills you must master to move from the beginning level, Marksman, to higher levels. The December SSUSA issue features the origin of ballistics-enabled Kestrel weather meters. SSUSA’s Editor John Parker covers the history of the Kestrel, and explains how more and more features were packed into the handheld device as it evolved. Today’s Kestrel is so much more than an impeller with wind speed/direction read-outs. The impressive Kestrel 5700 Elite with Applied Ballistics software is the latest model of a product that revolutionized long-range shooting by combining ballistic computer and weather meter in one portable device. Shooters can select either G1 or G7 ballistic coefficients, or to be even more specific they can select bullets from the Applied Ballistics custom curves library. With the Kestrel and its software, shooters can plot very precise trajectories, even to extreme long ranges. High Power Rifle competition originally evolved from the U.S. military course of fire. Climbing the classification ranks in NRA High Power Rifle can be daunting — it requires focus, practice and commitment to move up the ladder from Marksman all the way to High Master. In Glen Zediker’s three-part series, “Climbing the High Power Ladder”, Glen shares his tips for competitors that are looking to improve their skills beyond the intermediate level. The first installment focuses on stepping past Marksman classification to Sharpshooter. Read PART ONE HERE. In the months ahead, look for parts Two and Three in future SSUSA issues. These will cover the next stages in the climb: Expert, Master, High Master. If you’re serious about improving your High Power skill set, we suggest you view a DVD by David Tubb, 11-time National High Power Champion. David’s instructional DVD, “The Art & Technique of the Modern Match Rifle”, is a great resource for any High Power or position shooter. This 2-disc DVD provides over 4.5 hours of instruction and shooting demonstrations. We can confirm that this video is packed with great information — novice High Power and prone shooters who apply David’s methods should definitely improve their scores. David has included highlights from that DVD in a shorter promo video. While the shorter video is a sales tool, it’s very informative in its own right. Watch the video and you’ll learn a great deal just by watching how David shoulders his rifle, and how he adjusts and maintains his shooting position. David shows examples of prone, sitting, and standing positions. In the short “trailer”, David also provides helpful tips on adjusting sights, and placing the spotting scope. If you shoot Service Rifle, High Power, or prone, you can benefit from watching this short sampler video. The full 2-disc DVD is available for $49.95 from Creedmoor Sports. With over 4.5 hours of content, the DVD covers all the across-the-course positions, the set-up and use of aperture sights and diopters, High Power and long range targets, the approach method in offhand, proper placement and use of spotting scopes. The DVD includes bonus footage of David shooting strings in all of the across-the-course positions. Share the post "December Feature Articles in Shooting Sports USA"
Christmas is coming soon. Books have always been popular holiday gifts. If you haven’t completed your holiday shopping, here are some recommended titles that should please the serious shooters and firearms enthusiasts on your shopping list. For shooting clubs, books also make great end-of-season member awards. Most of us would rather have a useful book than one more piece of wood to toss in a box in the closet. Glen Zediker’s latest book, Top-Grade Ammo, is a great resource for all hand-loaders — beginners through advanced. This 314-page guide covers every aspect of the reloading process — component sorting, priming, sizing, bullet seating and more. With 430 photos, Top-Grade Ammo is a richly-illustrated, step-by-step guide to producing high-quality handloads. Unlike many reloading books, Top-Grade Ammo is current and up-to-date, so it covers modern practices and the latest precision reloading tools. While Zediker focuses on producing match-grade ammo for competition, this book will also help novice reloaders on a budget. This book features a special “lay-flat” binding so it’s easy to use as a benchtop reference. To view Chapter List and sample pages visit ZedikerPublishing.com. If you’re a serious long-range shooter, consider adding this book to your library. Relying on extensive ballistics testing, Modern Advancements contains some fascinating research results, including the effects of twist rate on muzzle velocity, BC, and precision. Other sections detail the evolution of modern rifle, bullet, and optics designs. And there is an important comparison test of chronographs. Laser rangefinders and wind measurement devices are explained in detail by contributing author Nick Vitalbo. This book is a valuable resource for anyone who wants to understand the current “state of the art” in today’s shooting world. There is a ton of “hard science” in this book — not just opinions. by Nancy Tompkins, $45.00, (Hardcover, 2d Edition). Nancy Tompkins is one of the greatest long-range shooters in American history. She has won five National Long-range Championships. Tompkins’ treatise is a must-read for serious Palma, F-Class, and High Power shooters. The revised Second edition includes F-Class equipment and techniques, and newly updated information. Color pictures. Topics include Mental & Physical training, Reading Wind & Mirage Shooting Fundamentals, International Competition, and Loading for Long Range. 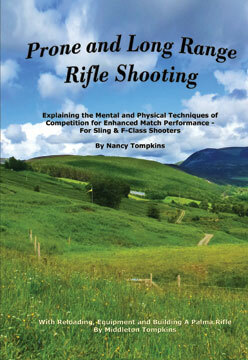 Nancy Tompkins is a 4-time winner of the National Long Range Championships, and has won countless other major events. Nancy has been on six Palma Teams (as both a shooter and a coach). Ryan Cleckner is noted for his ability to explain complex topics in an easy-to-comprehend manner. Now Cleckner has authored a book, the Long Range Shooting Handbook, which expands on the topics covered in Cleckner’s popular NSSF video series. The Long Range Shooting Handbook is divided into three main categories: What It Is/How It Works, Fundamentals, and How to Use It. “What It Is/How It Works” covers equipment, terminology, and basic principles. “Fundamentals” covers the theory of long range shooting. “How to Use It” gives practical advice on implementing what you’ve learned, so you can progress as a skilled, long range shooter. You can view Sample Chapters from Ryan’s Book on Amazon.com. by Tony Boyer, $34.50 (Softcover); $42.50 (Hardcover). Tony Boyer, the most successful shooter in the history of short-range benchrest competition, shares many of his match-winning tips in this 323-page book. The book covers all aspect of the benchrest discipline: loading, windflags, rest set-up, addressing the rifle, and match strategies. This is a high-quality publication, filled with valuable insights. Every serious benchrest shooter should read Tony’s book. Boyer has dominated registered benchrest in a fashion that will never be duplicated, having amassed 142 U.S. Benchrest Hall of Fame points. The next closest shooter, Allie Euber, has 47 Hall of Fame points. This handsome, full-color book is 323 pages long, with color photos or color illustrations on nearly every page. This book should be on the shelf of every short-range benchrest shooter. (Shooters in other disciplines will find the book helpful as well.) Butch Lambert says Mike’s book is “far and away the best Benchrest book written. Very comprehensive, it touches on every aspect of our game.” Mike’s 368-page book is dedicated to getting the most from modern rifle accuracy equipment with an emphasis on shooting 100-200-300 yard group benchrest tournaments. This book covers the most popular hardware plus new equipment offerings are covered, including external mount scopes, actions, triggers, stocks, wind flags, and more. Also covered are rifle handling techniques, note taking, tuning, bullet selection, goals, and match strategies. Mike provides many tips that will help active competitors update their own competitive program. This book by 11-time National High Power Champion David Tubb focuses on position shooting and High Power disciplines. Section One covers fundamentals: position points, natural point of aim, breathing, triggering mechanics and follow-through, sling selection and use, getting started, getting better, avoiding obstacles. Section Two covers mechanics of offhand, sitting, and prone positions. Section Three covers shooting skills, including wind reading and mental preparation. Section Four covers the technical side of shooting, with extensive disuctions of rifle design, load development, reloading barrel maintenance, and rifle fitting. We consider this book a “must-read” for any sling shooter, and there is plenty of good advice for F-Class shooters too. by Dr. Raymond Prior, $14.00 (Softcover). Cartridges of the World (15th Edition, 2016), belongs in every serious gun guy’s library. This massive 680-page reference contains illustrations and basic load data for over 1500 cartridges. If you load for a wide variety of cartridges, or are a cartridge collector, this book is a “must-have” resource. The latest edition includes 50 new cartridges and boasts 1500+ photos. The 15th Edition of Cartridges of the World includes cartridge specs, plus tech articles on Cartridge identification, SAAMI guidelines, wildcatting, and new cartridge design trends. In scope and level of detail, Cartridges of the World is the most complete cartridge reference guide in print. Cartridges of the World now includes a 64-page full-color section with feature articles. Share the post "Ten Great Gift Books for Precision Shooters"
The 2017 National High Power Rifle Championships commence today, June 7th, at Camp Atterbury, Indiana. The National Matches, which run through July 25, 2017, involve multiple National Championship events along with famed Trophy Matches. The nation’s finest civilian and military marksmen will convene on some of Atterbury’s 60 ranges for nearly 20 days of High Power rifle competition in a variety of formats. This year’s National Matches at Camp Atterbury will include the National High Power Championships, National Mid-Range Championships, National Long Range Championships, and various side matches, including NRA America’s Rifle Challenge, NRA 2-Gun, and an Extreme Long Range One Mile event. For more information about the 2017 National High Power Rifle Championships, including registration, calendar of events, official program, and more, click the links above or visit the official website. Shown Below is Reigning NRA Long Range National Champion John Whidden. This year’s sponsors include ArmaLite, Berger Bullets, Cutting Edge Bullets, Champion’s Choice, FN America, Hodgdon Powder, Krieger Barrels, Lapua, NEXUS Ammunition, Nightforce Optics, Nosler, OTIS, Satern/Liberty Barrels, Sierra Bullets, SK, Timney Triggers, Vihtavuori, and White Oak Arms. The shooting schedule has been adjusted to give competitors time to travel between events held at different locations. Following the completion of the XTC matches, competitors will have a day to travel to Camp Perry, Ohio, should they wish to attend the Small Arms Firing School and shoot the Civilian Marksmanship Program National Trophy Matches. Similarly, Smallbore Prone competitors in Bristol, Indiana, will have a day of travel to arrive at Camp Atterbury to participate in the High Power Mid-Range and Long-Range Prone matches. Share the post "National High Power Rifle Championships Commence in Indiana"
Friday at the Ben Avery Range in Phoenix, hundreds of competitors shot the individual Palma Match, a three-yardage (800/900/1000) day-long event. Competition was tough. The first four F-Open competitors didn’t drop a single point, all finishing with 450-point “cleans”. In F-TR it was equally close. Phil Kelley won with 447-23X, but the next three finishers were just one point behind at 446. In the sling division, John Whidden topped a very strong field with his 449-31X score, showing why he is the reigning National Long-Range Champion. But the next four Sling competitors were just one point behind at 448 points. The match can’t happen without the dedicated folks doing pit duty — it’s all part of the experience. Aussie Tim Lawrence’s stock was custom-built from Rosewood in New South Wales, Australia. The state of the art in F-Open rifles is very high indeed. Check out this handsome F-Open rig with a Speedy-designed Shurley Brothers ARK series wood stock. Checking the wind at the beginning of the day. Dawn at Ben Avery is beautiful. (Photo by Steve Fiorenzo). We had a chance to chat with David Tubb and John Whidden. Between the two of them, David and John have won 21 National Rifle Championships. David has 11 National High Power titles plus 6 Long-Range titles. Reigning National Long Range Champion John Whidden holds 4 Long-Range titles, having won his latest LR championship in 2016. David is truly a living legend in the world of competitive shooting and John is one of the best sling shooters in the game today, a man capable of winning any match he enters. In fact he did win Friday’s match in the Sling division, topping the field with a 449-21X. At the Berger SW Nationals we have the opportunity to meet old friends from all over the country and make new friends. Here are some folks we saw at yesterday’s match. Here’s Friday’s Sling Class winner John Whidden (449-31X) buckling up right before his relay. Tom Whitaker (left) chats with Emil Praslick III (right), one of the best wind coaches in the world. We caught past F-Open National Champion (and past SWN winner) Larry Bartholome logging his score at the 900-yard line. Larry is one of the greatest F-Open shooters ever. Larry posts in our Forum as “LBart”. And here’s the man who started it all, Walt Berger himself. Without his dream to build better bullets, and his hard work over many decades, there wouldn’t be this wonderful match each year. The popularity of this event is testimony to Walt’s dedication and passion for the sport. Walt still competes in Benchrest matches. Share the post "Berger SWN Day 3 Report — Individual 800, 900, 1000 Yards"
Today, December 16th, 2016, Creedmoor Sports is offering FREE SHIPPING on ALL orders within the Continental USA. Orders must be placed by 11:59 PM EST, on Friday, December 16. And now through January 2, 2017, Creedmoor is offering holiday sale prices on a host of products, including match ammo, shooting coats, gun cases, gloves, spotting scopes, shooting mats, eyewear, and much more. In its Holiday Shopping Catalog, Creedmoor has also cut prices on its best-selling instructional DVDs. You can save up to $9.50 per disc, with typical savings of 20% or more. Serious High Power rifle competitors can definitely benefit from these informative DVDs which combine instruction with photos, video, and interviews. Here are three highly recommended DVDs, the first from Triple-Distinguished Marksman Jim Hill and the other two from 11-Time National High Power Champion David Tubb. You can ORDER these DVDs Online. Share the post "Holiday GIFT Picks — Top 10 DVDs and Free Shipping"
Top shooters like 11-time National Champion David Tubb have mastered marksmanship by being continually aware of their physical state while shooting. This article by Glen Zediker talks about respiration and how to modulate your breathing to maximize on-target accuracy and consistency. This article originally appeared in the MidSouth Shot Report Blog. Elsewhere I’ve talked about what I call the “true fundamentals” of shooting. Put the sight on the target and pull the trigger without moving the sight. And we’ve talked about some of the mechanics, like natural point of aim, sight picture, and the trigger itself, that combine to assist this goal. Holding still sometimes takes more thought, and effort, than we might realize. Shooting well is a truly multi-faceted task that shooters like 11-time National Champion David Tubb have attended to through miniscule details, like being aware of the physical state continually while performing. Another crucial and largely unknown element is controlling breathing. Right. That thing we do to stay awake and alive. Breathing can be a calculated technique among competitive shooters, and that is because the state of the body in the framework of making a shot is a defining element in the effectiveness of the shooting platform. That platform, by they way, is you! I’ll break it down, and then offer a few suggestions on how to incorporate a better understanding of the dynamics of maintaining human oxygen supply. When we are breathing when doing nothing in particular but living, we’re not taking the deepest breaths we can when we inhale, and we’re not expelling all the air we had when we exhale. We’re also not breathing in and out, in and out, in and out in constant successions. We breathe in to a comfortable level. Hold that a bit. We breathe out to a comfortable level. And then we hold that state for a bit. Then we very naturally breathe in again. These cycles are on a balanced rhythm, and a relatively shallow cycle. It’s a lot different than when we’re doing something strenuous, like running. So, to fire a gun from our most stable state, make the trigger break in what shooting coaches call “the natural respiratory pause”. That’s the state between exhaling and inhaling. From a “human machine” standpoint, that’s when the body is most calm and stable. Learn to use the natural pattern of your breathing to experience the most effective (steadiest) hold. When we breathe normally we don’t inhale as much air as we can hold and then blow it all out, and we also don’t breathe continually in and out, in and out. Rather, we simply inhale and exhale to levels that are comfortable to us. Take aim and fire the shot when you have reached what some call the “natural respiratory pause,” or the natural resting point prior to inhalation where we are “using” the oxygen we have retained. It’s a narrow window. That window of opportunity varies widely depending on a lot of factors, but some experience dry-firing will show you where you stand. Share the post "Shooting Skills: Breath Control for Precision Shooters"
Glen Zediker’s brand new book, Top-Grade Ammo, is hot off the press. Many folks believe this is Glen’s best book ever. This 314-page resource covers every aspect of the reloading process — component sorting, priming, sizing, bullet seating and more. With 430 photos, Top-Grade Ammo is a richly-illustrated, step-by-step guide to producing high-quality handloads. Unlike many reloading books, Top-Grade Ammo is truly current and up-to-date, so it covers modern practices and the latest precision reloading tools. While Zediker focuses on producing match-grade ammo for competition, this book will also help novice reloaders on a budget. It’s written for all hand-loaders — beginners through advanced. This book features a special “lay-flat” binding so it’s easy to use as a benchtop reference. To view Chapter List and sample pages visit ZedikerPublishing.com. by Dr. Raymond Prior, $17.95 (Softcover). by Linda Miller and Keith Cunningham, $20.53 (Softcover). Many of our Forum members have recommended The Wind Book for Rifle Shooters by Linda Miller and Keith Cunningham. This 146-page book, published in 2007, is a very informative resource. But you don’t have to take our word for it. If you click this link, you can read book excerpts on Amazon.com. This lets you preview the first few chapters, and see some illustrations. Other books cover wind reading in a broader discussion of ballistics or long-range shooting. But the Miller & Cunningham book is ALL about wind reading from cover to cover, and that is its strength. The book focuses on real world skills that can help you accurately gauge wind angle, wind velocity, and wind cycles. Steven Boelter’s 352-page book is a comprehensive study of all types of rimfire ammunition (including 17s and 22 mags), with over 600 photos. In a remarkable undertaking, Steven Boelter fired every brand and sample of rimfire ammo he could acquire (including .22 LR, 17 Mach 2, 17 HMR and .22 WMR), and recorded all the results. In all, Steven tested 11 brands and 137 different rimfire rounds, firing over 32,000 test rounds. Share the post "TEN TITLES for Christmas — Great Gift Books For Shooters"